Corrupt, irrational, destructive, counter-productive: this scarcely begins to describe our farming policy. Just as mad cow disease exposed us to horrors – feeding cattle on the carcasses of infected cattle – previously hidden in plain sight, so the recent floods have lifted the lid on the equally irrational treatment of the land. Just as BSE exposed dangerous levels of collusion between government and industry, so the floods have begun to expose similar cases of complicity and corruption. But we’ve heard so far just a fraction of the story. I hope in this article to lift the lid a little further. The issues I’ve begun to investigate here – the corrupt practices and the irrationality of current policies – should unite both left and right in a demand for change. They should be as offensive to those who seek to curb public spending as they are to those who seek to defend it. In July 2013, the British government imposed a £26,000 cap on the total benefits a household can receive. In the same month it was pursuing a different policy in urgent discussions in Brussels: fighting tooth and nail to prevent the imposition of a proposed cap precisely ten times that size (€300,000, or £260,000). The European Commission wanted this to be as much money as a single farmer could receive in subsidies(1). The British government was having none of it. It won, with the result that this measure is now discretionary: member states can decide whether or not to cap the benefits they give to farmers. Unsurprisingly, the British government has decided not to. The biggest 174 landowners in England take £120m between them. A €300,000 cap would have saved around £70m(2). If farmers were subject to the benefits cap that applies to everyone else (£26,000), the saving would amount to around £1bn(3). Why should the cap be imposed on the poor but not the rich? Lying in a coma since December had not affected her ability to work, or her progress towards achieving her aspirations. She’s in a coma because she suffered a heart attack. The heart attack, her father maintains, was brought about by extreme stress, caused by the threat of having her benefits stopped despite a mental illness so severe that she had been unable to work for 27 years. Two days before this letter was read to the Commons, the farming minister, George Eustice, was speaking at the conference of the National Farmers’ Union(5). He began by paying “tribute to the great work” of its outgoing president: “thank you for what you’ve done.” Can you picture a minister in this government saying that about the head of any other trade union? The NFU’s primary work is lobbying. Yet the critical distance between government and lobbyists you would expect in a functioning democracy is non-existent. The same goes for distance of any other kind. The address of Eustice’s ministry, the department for environment, food and rural affairs, is 17 Smith Square, London SW1. The address of the National Farmers’ Union is 16 Smith Square, London SW1. Though farmers comprise just 0.3% of the population of England and only 1.4% of the rural population(6), ministers treat them and their lobbyists as an idol before which they must prostrate themselves. Rural policy and farming policy are, to the government, synonymous; 98.6% of rural people are marginalised by the decisions it makes. Eustice continued his speech by announcing that he is seeking to “slash guidance”, to “drive down the burden of farm inspections further”, and that he is “pushing hard at an EU level for sanctions and penalties to be more proportionate.”(7) These are the sanctions and penalties imposed for breaking the conditions attached to farm subsidies. They take the form of a reduction in the benefits a farmer receives. “More proportionate” is the government’s code for smaller. So just as the rules and penalties regulating the ordinary recipients of benefits have become so onerous that many find them almost imposssible to meet, the rules and penalties attached to the benefits the rich receive are being reduced. But how? The conditions attached to farm subsidies (which are called cross-compliance) are already so weak as to be almost non-existent. Let me give you an example. There are several rules which are meant to encourage farmers to protect their soils from compaction and erosion(8). Their purpose is to sustain fertility, to defend water supplies and the ecology of the rivers and to prevent flooding. Not one of these measures appears to be either functional or enforceable. All farmers receiving subsidies must complete a soil protection review. This is a booklet they fill in to show that they have thought about soil erosion and identified any problems on their land. Once every 100 years on average, an inspector from the Rural Payments Agency will visit the farm(9). If the inspectors identify a soil erosion problem, they have the power to … er, offer guidance about how to rectify it. And that, in practice, is it. There are hardly any cases of this guidance being followed up with even the threat of action, let alone the imposition of any penalties(10). And even the guidance, Eustice now promises, will be “slashed”. Bad enough? Oh no. Most inspectors have no expertise in soil erosion. So all they tend to do during their centennial visits is to ask the farmer whether he or she possesses a soil protection booklet. If the answer’s yes, that’s job done, even if their soil is rushing off the fields and into the rivers. To discover whether or not farmers are causing a related problem – soil compaction through the use of heavy machinery in the wrong conditions – inspectors need to dig holes in the fields with a spade, to look at what has happened to the soil layers. But – and here you have a choice of laughing or crying – they do not possess the power to conduct an “invasive investigation” (ie digging a hole)(11). So they are not permitted even to detect, let alone enforce, a breach of the compaction rules. Are we there yet? Nope. Even these unenforceable non-rules are deemed too onerous for farmers growing a crop that both strips and compacts the soil faster than almost any other. Because the rows are planted so far apart, and because the soil is left bare through autumn, winter and much of the spring, maize causes more severe erosion than any other cereal crop. Yet, as I pointed out a fortnight ago, maize growers are entirely and mysteriously exempted from the erosion rules(12). Since then I have asked the department five more times for an explanation. While all my other questions have been answered, albeit half-heartedly, this one was not fudged or spun or mangled, but simply ignored. I’ve never encountered this before: a government department refusing even to acknowledge that a question has been asked. What should I conclude but that the answer is highly embarrassing? I guess that because it’s almost impossible to grow maize without wrecking the soil, and because the government’s plans for biogas production depend on growing maize to fuel anaerobic digesters, the only way to reconcile this conflict is to remove the crop from the regulations(13). In a devastating response to claims made in the Guardian’s letters page by the National Farmers’ Union(14), the soil scientist Robert Palmer calculated that so much compaction and erosion is caused by maize growing that a 10-hectare field causes the run-off of 375 million litres of water(15). Maize expanded 24% between 2012 and 2013, much of it in sensitive catchments. This is a formula for repeated flooding. As a result of these multiple failures by the government, even Farmers’ Weekly warns that “British soils are reaching crisis point”(16). Last week a farmer sent me photos of his neighbours’ fields, where “the soil is so eroded it is like a rockery. I have the adjoining field … my soil is now at least 20 cm deeper than his.” In the catchment of the River Tamar in Devon, one study suggests, soil is being lost at the rate of five tonnes per hectare per year(17). I could go on. I could describe the complete absence of enforceable regulations on the phosphates farmers spread on their fields, which cause eutrophication (blooms of algae which end up suffocating much of the freshwater ecosystem) when they run into the rivers. I could discuss the poorly-regulated use of metaldehyde, a pesticide that is impossible to remove from drinking water(18). I could expand on the way in which governments all over Europe have – while imposing a temporary ban for flowering crops – permitted the use of neonicotinoid insecticides for all other purposes, without any idea of what their impact might be on animals in the soil and the rivers into which they wash. The research so far suggests it is devastating, but they were licensed before any such investigation was conducted(19). There is just one set of rules which are effective and widely deployed: those which enforce the destruction of the natural world. Buried in the cross-compliance regulations is a measure called GAEC 12(20). This insists that, to receive their money, farmers must prevent “unwanted vegetation” from growing on their land. (The rest of us call it wildlife habitat). Even if their land is producing nothing, they must cut, graze or spray it with herbicides to get their money. Unlike soil erosion, compaction and pollution, breaches of this rule are easy to detect and enforce: if the inspectors see trees returning to the land, the subsidy can be cut off altogether. 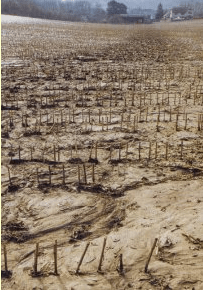 Many of the places in which habitats might otherwise be allowed to recover – principally the highly infertile land in the uplands – are kept bare by this rule. It’s another means by which floods are hard-wired. The government has just raised the incentive to clear such land, by announcing that hill farmers will now be paid the same amount per hectare as lowland farmers – equalising the rate upwards, not downwards(21). It also seems to be on the verge of raising the amount of public subsidy paid to the owners of grouse moors by 84%(22). These are among the richest people in Britain. The management of their land to maximise grouse numbers involves the mass destruction of predators and the burning of blanket bogs, causing floods downstream(23) and releasing large amounts of carbon(24). If this looks like the work of a self-serving club of old school chums, that’s because it is. First we give landowners our money: vast amounts of it, uncapped and almost unconditional. Then we pay for the costs they kindly dump on us: the floods, the extra water purification necessitated by the pollution they cause, the loss of so many precious and beautiful places, the decline of the wildlife that enchants and enraptures. Expensive, irrational, destructive, counter-productive: this scarcely begins to describe our farming policies. But it need not happen this way. Change the rules, change the incentives, support impoverished farmers to do the right thing, stop support for the rich farmers altogether, and everything else can follow. In my book Feral I’ve begun to sketch out what a functioning, lively, wonderful countryside could look like(25). High in the catchments, where most of the rain falls and the soil is so poor that farming is sustained only through public money, we should be paying the farmers to replant trees, which hold back the water and stabilise the soil. To these returning forests we could reintroduce animals that have been wiped out across much or all of this land: capercaillies, wildcats, pine martens, eagles, lynx, moose, bison, even, in the Scottish Highlands, wolves. Aside from the opportunities this rewilding presents for re-enchanting our lives, experience elsewhere in Europe suggests that eco-tourism has a far higher potential for employment, for supporting communities, for keeping the schools and shops and pubs and chapels open than sheep farming does(26). 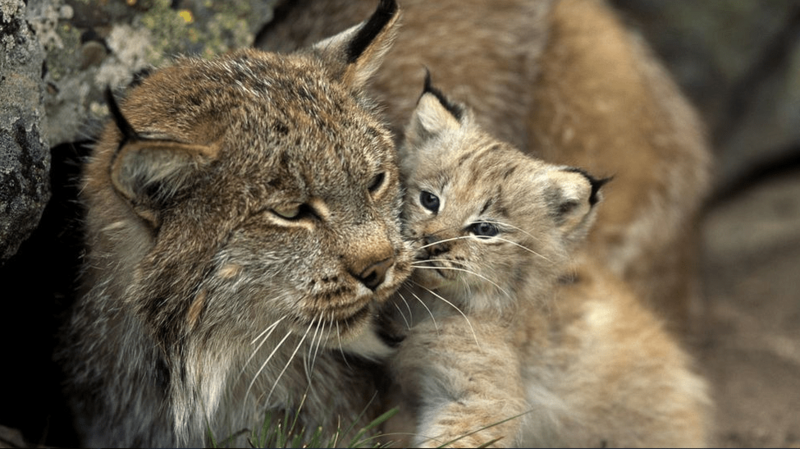 Lynx and cub. Photo: Norbert Rosing. We should turn the rivers flowing into the lowlands into “blue belts” or “wild ways”. For fifty metres on either side, the land would be left unfarmed, allowing trees and bogs to return and creating continuous wildlife corridors. Bogs and forests trap the floodwaters, helping to protect the towns downstream. They catch the soil washing off the fields and filter out some of the chemicals which would otherwise find their way into the rivers. A few of us are now in the process of setting up a rewilding group in Britain, which would seek to catalyse some of these changes. Where soils are fragile and the risk of erosion is high, farmers should be encouraged to move towards regenerative or permacultural techniques: clever new methods which can produce high yields without damaging soil, water and wildlife(27). A fortnight ago, Rebecca Hosking, a farmer who uses regenerative techniques, published a photo of the confluence of the stream leaving her land with the stream leaving her neighbour’s land(28). His looked like cream of tomato soup; hers was clear. Rebecca Hosking’s stream meets her neighbour’s. The British government currently spends – on top of the £3.6bn in farm subsidies disbursed in this country – £450m on research and development for the food and farming industries(29). Much of this money could be characterised as corporate welfare. Yet a search of the British government’s website finds not one mention of permaculture. Not a penny of public money is being spent on investigating its potential here. It’s not hard to see how a land which is now being pillaged, eroded, polluted and wrecked could be allowed to remain productive – even to produce more food for people than Britain does today (though perhaps less for livestock and biofuel) – while also supporting a vibrant ecosystem. It is not hard to see how public money could be spent to deliver social goods rather than social harms. But for this to happen we must insert a political crowbar between numbers 16 and 17 Smith Square, to prise the government away from the industry it is supposed to regulate. in England 2014: complete edition. 9. In other words, 1% of farms are visited for a cross-compliance inspection every year. 11. The Rivers Trust, as above. 18. Water UK, 13th August 2013. Briefing paper on metaldehyde. 22. Defra, December 2013, as above.